Videos, Practice, and More! Get started with our platforms and our modules. Want to binge watch training videos? Check them out by category! Collections of Knowledge Base articles to get you started. Learn more about coming to hang out with us during our webinar series! Your one-stop-shop for articles and info about Finalsite. Resources is Finalsite's file-management solution. This is where you can upload files for use throughout your website, including media files, PDFs, or any other documents you want to link. Resources is a powerful media management tool as well, automatically resizing images and videos to serve them responsively on site pages, and seamlessly handling alt tags to keep everything accessible. Tags and descriptions make finding the correct file a snap; once you've found it, Resources' advanced features mean that you can move files among folders, rename and even update file sources, all without breaking existing links. 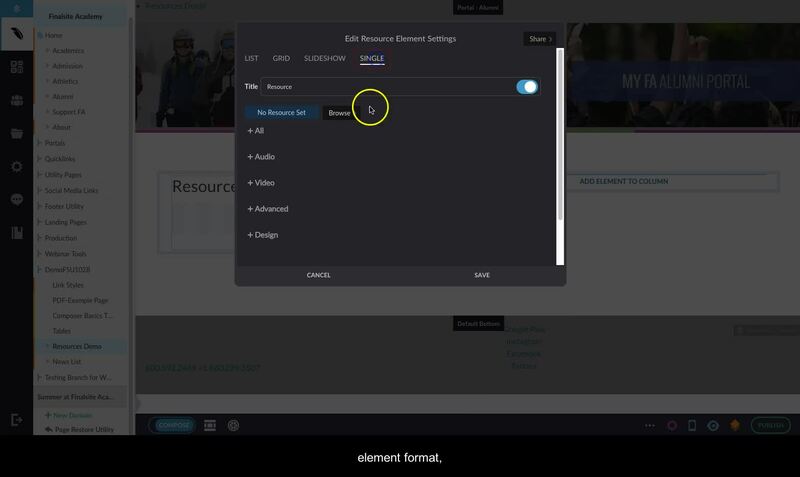 Below, you will find Training Videos to get you started on Resources, as well as some additional information about Finalsite. For a more comprehensive look at how Resources works, please check out the Resources section of our Knowledge Base. Create a new public folder in Resources by hovering over the "Public" folder and clicking on the three-dot menu to select + Folder. Add images, videos, or files to the folder by clicking on the green "Upload Public Resource" button in the upper-right corner. Click the back arrow on Resources and then click on Galleries. Use the green "+ Create Public Gallery" button at the bottom of the left navigation to create a gallery. Then use the "Upload Public Resource" button in the upper-right corner to add items to your gallery. Add a Resource, Video, or Image element on a site page. These elements can be found in the Standard section of the library. Add images and videos to test out how they look on your site. Resources is very new! As we create additional videos and information, we will post them here. Can I move files from folder to folder? How does Resources help me? You can! File URLs are not dependent on folder location, so you can move files wherever you need them to without breaking any existing links. Anybody who contributes to your website can upload files to Resources. Private folders allow admins to upload content without worrying about it being accessible via the website. And non-admin users - such as Posts contributors - can upload files to use in their content without needing an admin account. Resources automates many of the tedious aspects of file curation. You can apply tags in bulk, and use them to find files later. Resources will tell you if a file is in use on the site before you delete it (and even provides a list of 'orphaned' files that aren't linked anywhere, for ease of maintenance). You can move or rename files without worrying about breaking existing links, and much more.